Selling for $349.99 0 2 Like this product? It is loaded with great features like fast start and power plus battery technology, it’s no wonder the Samsung Series 3 Notebook is considered the everyday notebook. 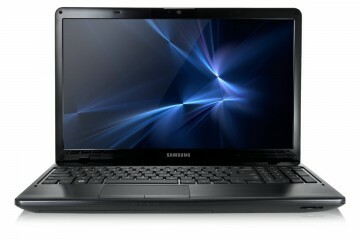 The Series 3 Notebook from Samsung is the perfect combination of efficiency and design. From checking emails to updating your status to browsing the Web and rocking out to music, this notebook does it all. The Series 3 Notebook from Samsung is the perfect combination of efficiency and design. It’s the everyday notebook for the everyday you. From checking emails to updating your status to browsing the Web and rocking out to music, this notebook does it all. Loaded with great features like Fast Start and PowerPlus Battery technology, it’s no wonder the Samsung Series 3 Notebook is considered the everyday notebook. computing easy as 1-2-3. Fast Start technology means you don’t have to wait for your notebook to boot up: one touch of the power button and it’s up and running almost instantly Easy Migration technology allows you quickly to transfer all your files from your old PC to your brand new Series 3 notebook. With a streamlined and ultra-lightweight design, hitting the road with your Series 3 notebook has never been easier. Next-generation Bluetooth 4.0 connectivity provides faster throughput while minimizing on power requirements. Backward compatible with older Bluetooth-enabled peripherals such as printers and cell phones. 2 super-speed USB 3.0 ports with up to 10x the speed of USB 2.0 (and is backward compatible with your USB 2.0 peripherals). HDMI port for connecting to a compatible HDTV. Reimagined to be all about you, Windows 8 lets you personalize your desktop and gives you instant access to all your favorite people, apps, sites and more. Use SW Update to keep your PC running smoothly with the latest software and drivers, and to download Samsung’s Quick Starter feature, which adds a toolbar and start button for easy navigation in the desktop view. Plus, connect to SkyDrive® and store files, photos, videos and more, so wherever you go, you’re connected to the cloud. Measure battery life in not just hours, but years. A battery designed for the long haul, the Samsung Power Plus technology gives you more years and more hours. This technology retains 80% of the original battery capacity for up to 1,500 charges. After 3 years of use, you still have a battery that works for you day in and day out. That's power when you need it. Samsung Group is a South Korean multinational conglomerate companyheadquartered in Samsung Town, Seoul. It comprises numerous subsidiaries and affiliated businesses, most of them united under the Samsungbrand, and is the largest South Korean chaebol (business conglomerate).